Pipelines on GovTribe contain Pursuits, and each Pursuit represents an individual opportunity at some stage of the review, response, or bid process. It is most common to create a Pursuit from an Opportunity or from an Award that you find on GovTribe. However, there are also situations where you may wish to create a Pursuit prior to identifying the appropriate Opportunity or Award to link. We call this creating the Pursuit manually. This short video shows you how to create a new pursuit manually. A written walkthrough with screenshots is also included below. There are two ways to create a Pursuit manually. From the Pursuits search page, or from the Pipeline stage. Start by select Pursuits under My GovTribe in the side menu. On the Pursuits page, click the Add Pursuit button to the right of the search bar. You are then presented with a pop up modal. You must complete the information in the first tab in order to finish creating the Pursuit. 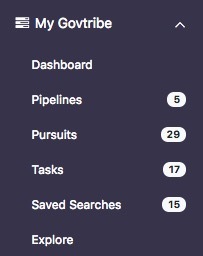 Select from a drop-down list of your Pipelines and their corresponding stages to indicate where you want the Pursuit to go. We highly recommend that you also complete the information in the Details tab as well. The Details tab of the Add Pursuit modal allows you to enter key information about the opportunity you are pursuing. You can modify the name of the Pursuit and add a Description, if you wish. Start by going to the Pipeline to which you'd like to add a new Pursuit. 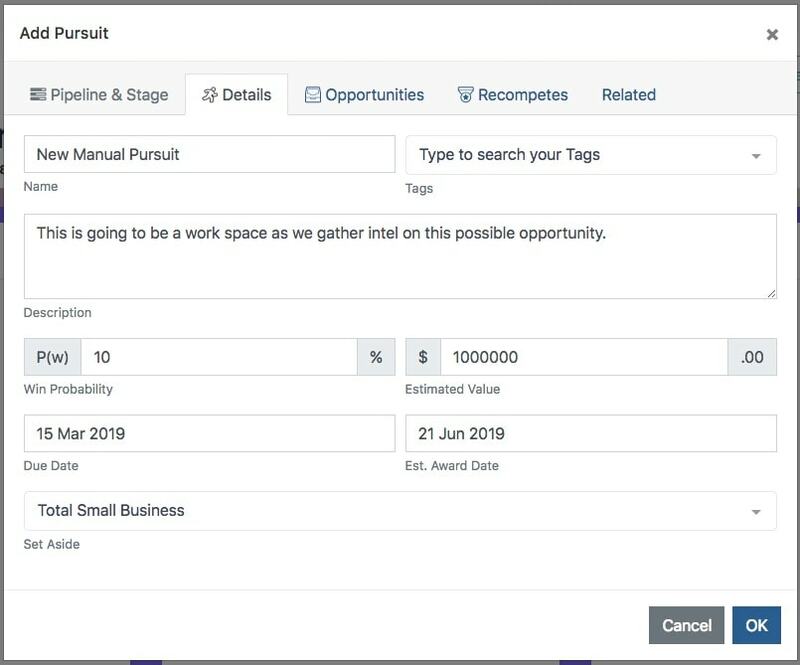 You can add a Pursuit manually to any stage of your pipeline, including Triage. Click the Add Pursuit at the top of that stage. Since you initiated Pursuit creation from the desired Pipeline and Stage, the first tab is completed for you automatically, and you are presented with the Details tab of the Pursuit creation modal.